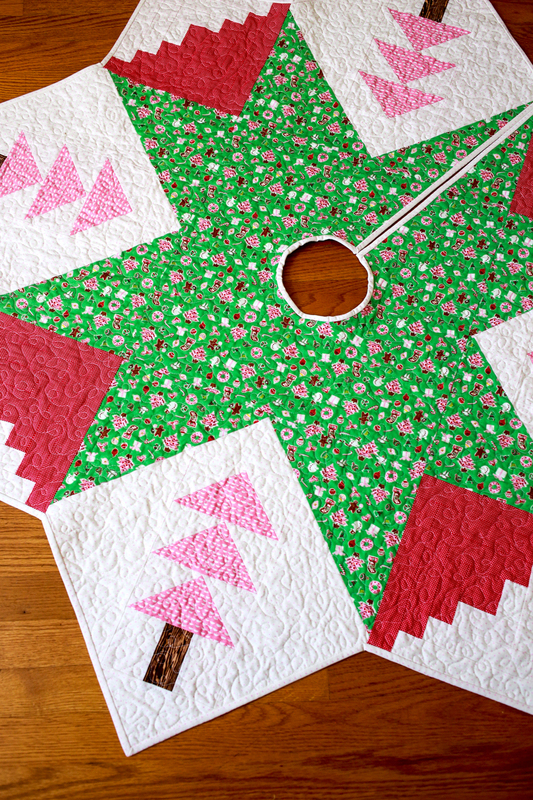 I have been wanting to make one of these ever since my friend Christina designed it for a swap way back in 2010. A few years later, she released her pattern for it, but I didn't have a tree! Now that we're in a house with room for a full size tree, I finally could make one! For the fabrics and colors I wanted it to be traditional Christmas colors. I'm not a huge fan of red, so adding in pink helps balance it out for me. I started with this adorable green print from Little Joys by Elea Lutz and pulled blenders in shades to match. For the background and binding I used Le Creme Swiss Dots by Riley Blake in baby pink. The top actually came together really quickly back in September. Then I let it sit for a little while. 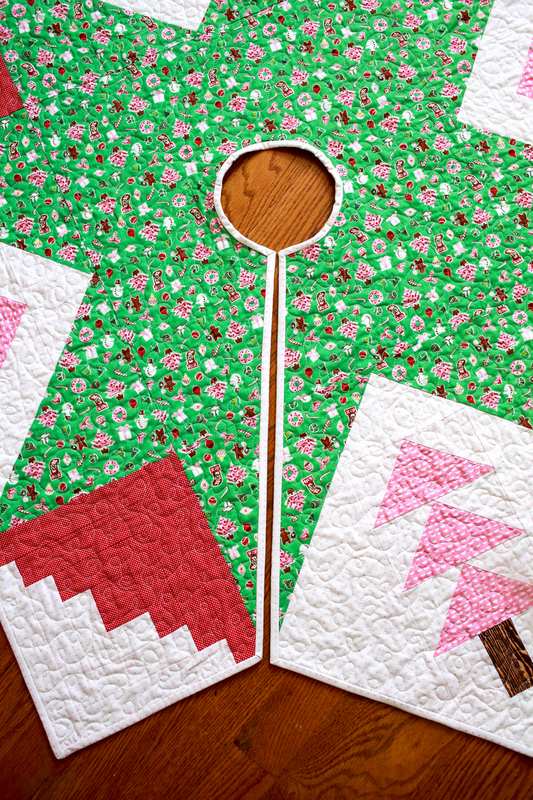 I wasn't sure how to quilt it right away, plus I was already worried about the binding! 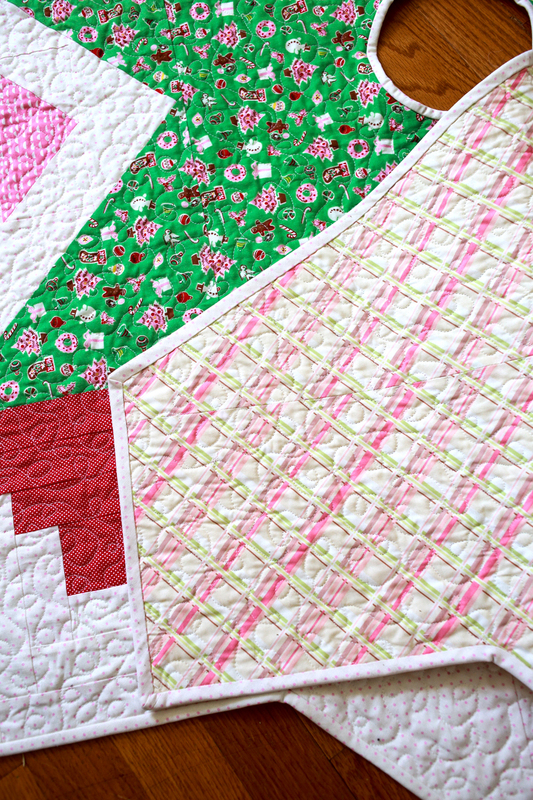 I ended up dusting off my free motion quilting skills and did a simple doodle loop all over. It felt like it was the right choice for this project and I'm glad I took the time to do it. It took a little while to get comfortable with it again, but it was worth it! 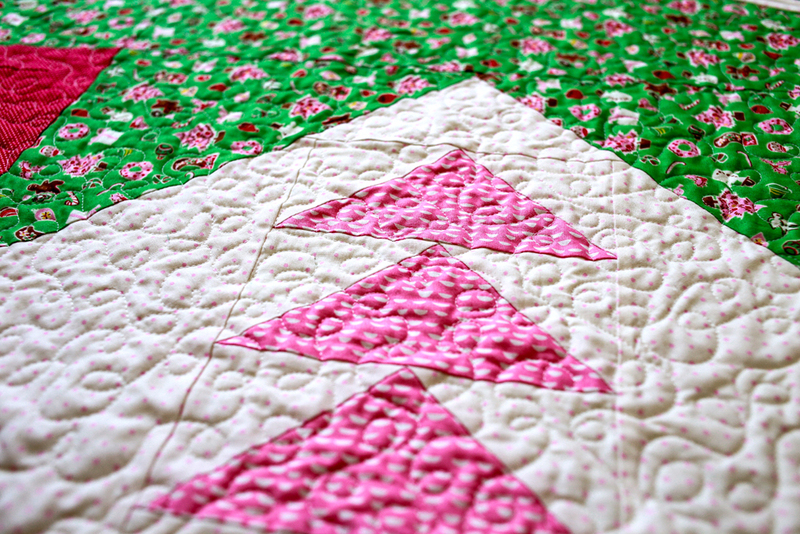 For the binding, I knew I wanted to use the same fabric as the background so that it would blend in nicely. I don't know why I was so worried, the binding went on really smoothly. The inside corners were a breeze and even the inside circle went on easy. I attached it to the front by machine and took the time to hand stitch it to the back. I love, love, love how this project turned out. It's such a unique design and I think it looks great around our tree. I'll look forward to pulling this out every year! 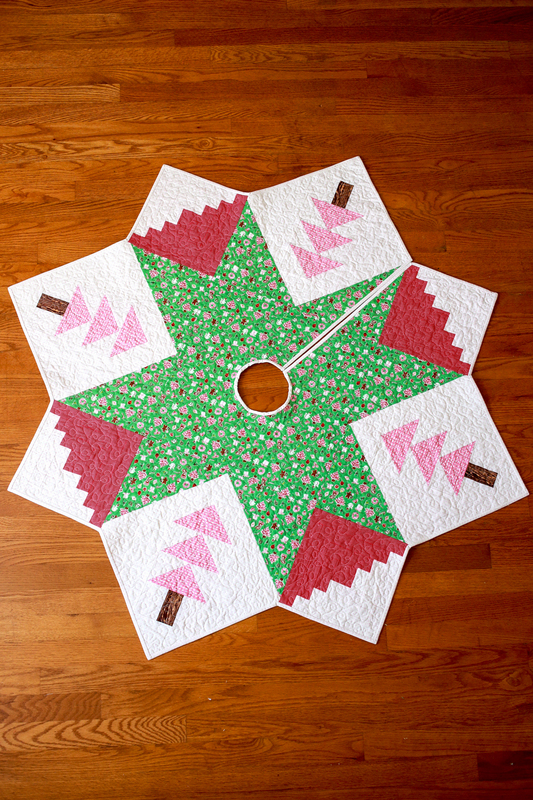 Your tree skirt turned out lovely - it is a unique design - beautiful! 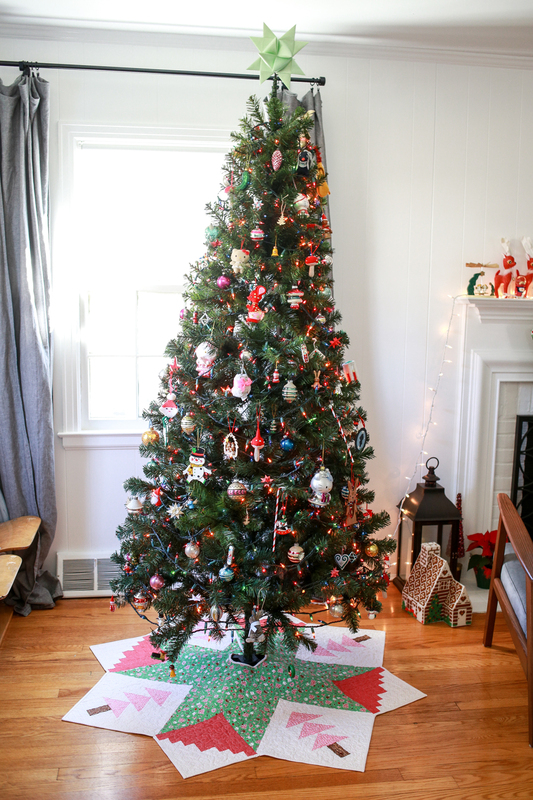 Love how it looks under your sweetly decorated Christmas tree. I think I even recognize some ornaments from our own tree :)! 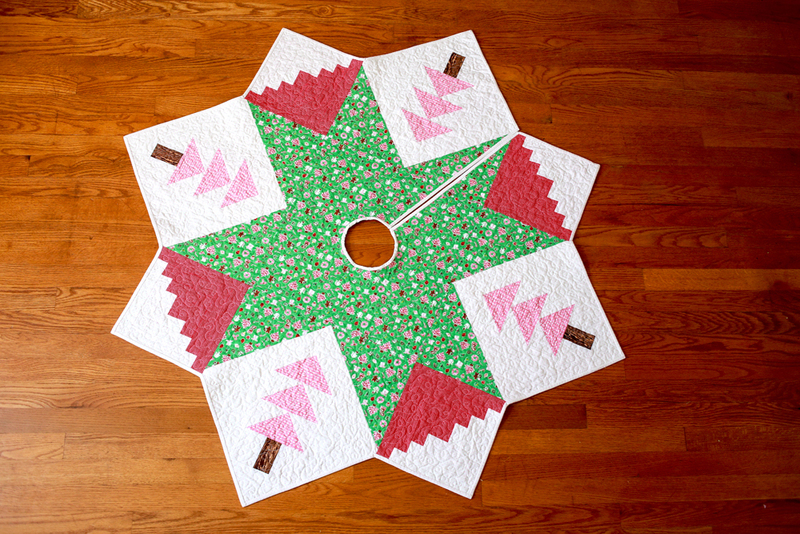 Your tree skirt is darling, Jeni! Congratulations on getting it done and under the tree!